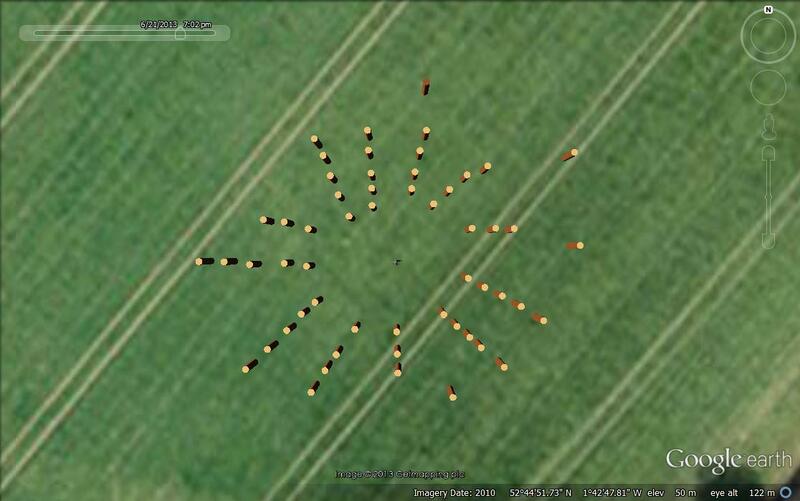 Timber Circles – The Catholme ‘Sunburst’ Model. “The Sunburst ring ditch lay between an internal and an external bank, with a single break in its western side; it was just over 2m wide and survived to over half a metre deep. In places it seemed that it may have been preceded by a ring of pits, which lined up with the pits radiating out from the monument. We excavated 13 of these small pits beyond the ring ditch, showing that most had not held posts but were U-shaped in profile. After the ditch had refilled, it had been dug out again in segments. 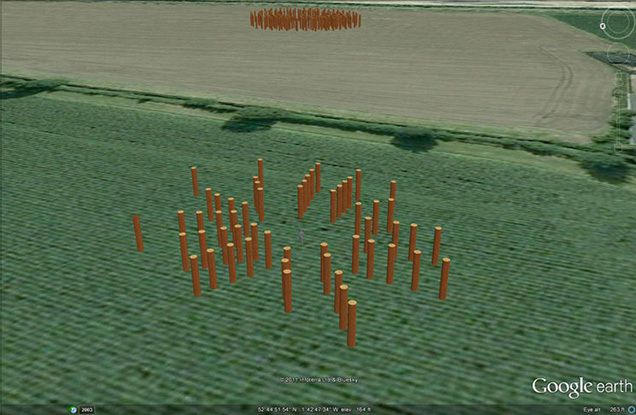 The Catholme ‘Sunburst’ with ‘Woodhenge’ in the next field. At the centre of the ring ditch were the remains of a burial pit 2.4m×1.8m and 0.4m deep. The body had completely deteriorated but was identified by characteristic stains in the soil. Associated with the body were sherds of pottery and worked lithics. Ann Woodward has shown that the sherds probably derived from a single Beaker of David Clarke’s “Northern/North Rhine” group; petrographic study by Rob Ixer indicated that it may have travelled from northern England, or more likely from Scotland, suggesting the person was of some importance. Similarly, Lawrence Barfield suggests that some of the stone artefacts from the monument were not local. The Catholme ‘Sunburst’ from above. 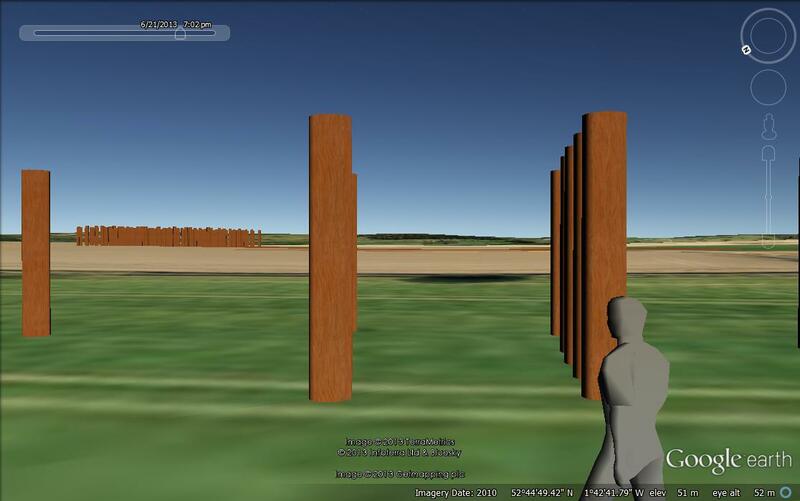 The Catholme ‘Sunburst’ with ‘Woodhenge’ on the horizon. 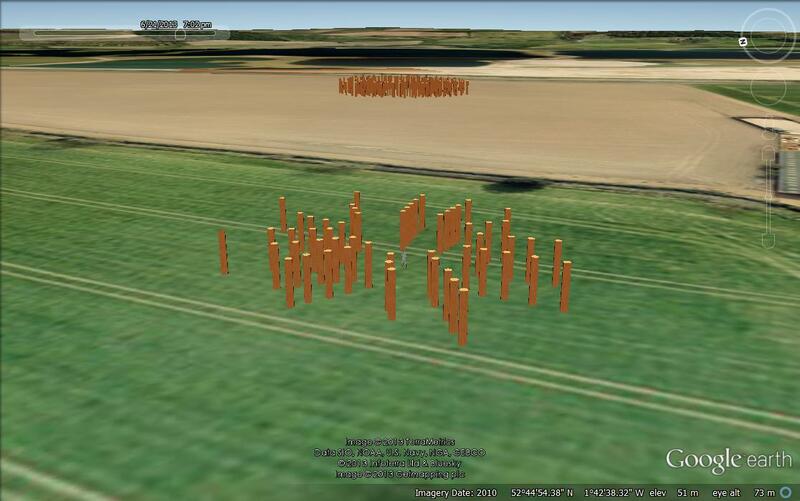 Watters’ 3D modelling of the GPR data had accurately picked up the segmented recutting of the second phase, in addition to the earlier ditch and the central burial. It had also picked out the surrounding pits. Most significantly, the GPR had shown a circle of pits beneath the ring ditch, which we identified in excavation as a possible earlier phase. We would have missed these by excavation alone, which sampled the ring ditch in plan and section according to the scheduling constraints. However, with the three-dimensional GPR data, it was possible to understand this critical phase. Read the full story of the Catholme Timber Complex here.